What is the biggest challenge of our generation? In the past 50 years the world has changed like never before. The world is like a village: in 24 hours you can travel all over the earth (if you have enough money). And many of our daily products and food items have traveled around the world. So the technological progress also brought wealth, right? 1) So many people cannot read, have no computer and not even enough to eat. Many children have to work hard and long. (Do you have children?) So many people work 6 days a week, 12-14 hours per day, and still what they earn is not nearly enough. They go to bed hungry in one of many slums. They work to make our food, clothes and luxury items cheap. 2) Today, 8 August 2016, we have depleted the resources for 2016 which the Earth can regenerate within one year. For example, the average German person consumes twice as much as they are entitled to. Last year’s “Earth Overshoot Day” was 5 days later. Every year, it is a little earlier, and in 2030 we will need a second Earth. Global food, lifestyle und luxury – the right way? Our Fairdirect sustainability information label shows at a glance how sustainable each product is. Multiple factors are measured objectively and combined to a single indicator on a fixed scale. This indicator is influenced, among others, by the type of livestock raising, the type and place of production of raw and auxiliary materials, the number and length of transports, fair wages along the entire production chain, energy consumption and the quality of workmanship. By a QR code printed alongside on the product, you will be able to access the product’s webpage maintained by Fairdirect / Epelia. There, you will find more details about the product, information about the producer and results of Fairdirect producer checks on the spot. 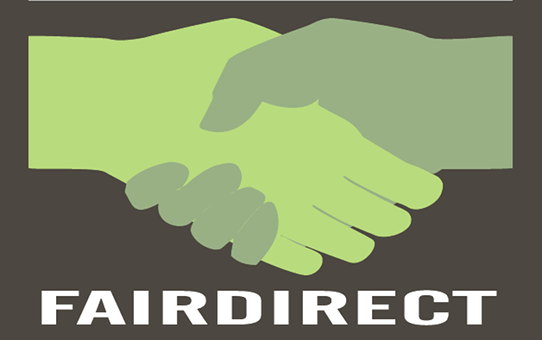 In addition, a producer can opt to also sell their product online on this page, optionally in alliance with other producers from the same region (meeting at a farmers market, for example, benefiting their common customers with combined shipments using our “Fairdirect shipping cell” concept). What we buy has many many consequences, at times at the other end of the world. That is why we need to know what we are buying. Also, long retail chains lead to cheap prices for producers and high prices for consumers. We believe in a better, fairer solution!